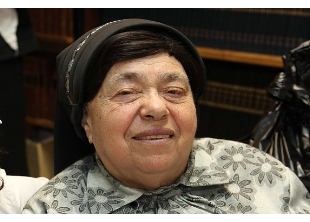 Rebbetzin Bat-Sheva Kanievsky died in the early afternoon on Shabbat, in her home in Bnei Berak. She suffered a heart attack. Magen David Adom emergency crews arrived and attempted to resuscitate her, but to no avail. Rebbetzin Bat-Sheva Kanievsky was the wife of Rav Haim Kanievsky and the daughter of Rav Yosef Shalom Elyashiv, known as “the greatest posek,” or halakhic decisor. The rebbetzin’s funeral will depart the Lederman Synagogue in Bnei Berak Saturday night at 10:00 p.m. In the Table below you have only once in the whole Torah, תחיית המתים -The revival of the dead, with the minimal appearance in the Torah התשץ 5790 , which the date given by the Ramban in the book “song of songs”.